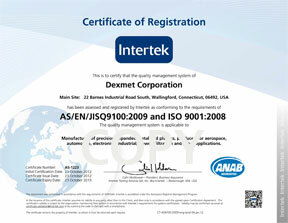 Dexmet is now AS9100 Certified! In keeping with our mission to become the recognized worldwide leader for foil gauge expanded metal and thin film expanded polymers, Dexmet Corporation is proud to announce that we have received AS9100/ISO 9001:2008 Certification for the aviation, aerospace, and defense industries. The company subscribes to the Standard’s requisite features, including risk management and configuration control, while maintaining a proactive commitment toward customer satisfaction.